This is an important word in the introvert vocabulary. I have recently been on a break to have some much needed down time from my blog/writing and to recharge. You might think I have been sitting by a lake staring off toward the horizon, but I have been busy with some life things. Actually sitting by a lake and staring off at the horizon sounds pretty good to me but it has been chilly here. Chilly for Southern California and sitting outdoors might not be so relaxing. Although, we still have sunshine. Pause and reflection are good for everyone but essential to the introverted temperament. I spotted a really cute post on the Huffington post about the topic which included this chart by Gemma Correll. I have been sort of in the “Region of Hibernation” with the colder weather. I definitely enjoyed some time with my kids over the holidays. I did do some online ordering of a few gifts. I had some new adventures. I made the 7+ hour drive on the 101 up to the Bay Area ( San Francisco Bay area) alone in a rental car and later realized that I did not know that the headlights did not turn on automatically. I had dinner in Alameda, at a Burmese restaurant, which was delicious. I hiked along a trail near the ocean in Half Moon Bay. I drove all the way back to Southern California with my daughter’s great company this time, now knowing how to operate the headlights, and saw some “Russian space debris” heading on a 45 degree angle toward the earth with a big fiery tail behind it. At least we are told it was Russian space debris. I even saw the new Star Wars movie in 3D. Now I think I am ready for a bit of “Solitude Mountains” with a “Sea of Books” nearby. Stream of Consciousness Saturday is hosted by LindaGHill. This entry was posted in Blogging, Blogging Community, My Life, Writing and tagged Stream of Consciousness Saturday on January 2, 2016 by Deborah Drucker. Sounds like a nice balance of good company alone and good company with your daughter. I enjoyed imagining your trip to the bay area. Especially the hike in Half Moon Bay. Never been there, but have heard so many good things about it. Happy New Year, from one introvert to another! Thank You, JoAnne. It was fun getting out of my usual routines. The coastline near Half Moon Bay is very beautiful. Highway 1 runs right near the ocean. Sounds ideal! We all need some downtime and it really refreshes the body in so many ways. Have a great 2016. Welcome back! I am an introvert as well and understand the importance of recharging. Happy to read your post. 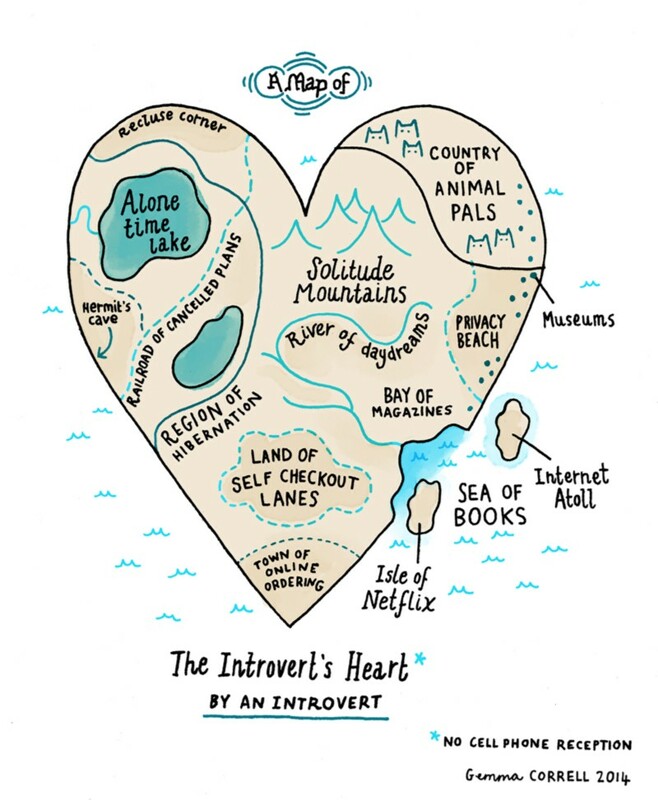 I love the heart drawing of the ‘introvert’. I enjoy down time too since life is often so busy. Adam and family just moved in with us last week. It will be for a couple of months. They live near that gas field leak in Porter Ranch. The gas company has given some relocation funds which helps but the property values have understandably decreased so things are a mess. I have a little bit of free time now since Adam and family went to the Huntington today and Michael is out riding his bike. I have so much to catch up with at home including a ton of laundry which really means that this isn’t ‘free time’. Hope you guys were able to ring in the New Year with good health and a lot of joy!! Hi Cynthia, Happy New Year to you and your extended family! Things must be a bit hectic over at your place. I have been reading a little about the gas leak and saw something about the people being evacuated but did not realize it was so close to home. Hope that gets repaired ASAP. Solitude Mountains sounds like a great place to spend some time Deborah. Do we have to carry the books up ourselves? Looking forward to notes in 2016. Sounds very relaxing and rejuvenating! That’s really strange about the Russian space debri. Nice to have you back! I don’t watch the news on tv. My favorite news channel stopped showing the news at the time I liked watching it, so I get my news from an app on my iPad. Me too. I don’t watch the news but read about it on the internet. Just mentioned it in case you wanted to check it out. There was another report about it today on Huffington Post. I was wondering where it finally crashed. My daughter and I were glad we did not see any explosions. The Huff Post article says it crashed in the Pacific Ocean. Oh no, did their space capsule explode and kill astronauts?? No, don’t worry. It was not that kind of debris. I think it was the rocket booster but don’t quote me. I went onto my app and searched for any information about it but couldn’t find any. There are some others with video that were posted the day after it occurred. Thank you Deborah! That was very interesting and you are the first I have heard about it.